Satisfy your burger craving on game day with our easy and hearty Cheeseburger Dip! Looking for an alternative to your chips and salsa routine at your pigskin party? 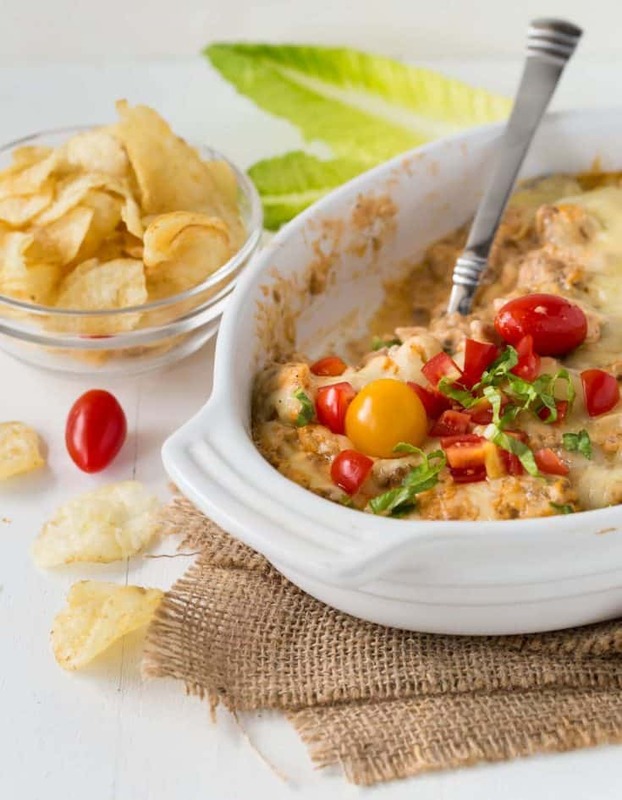 This warm, melty Cheeseburger Dip has all the taste appeal of a traditional burger in dippable form – perfect for casual entertaining. 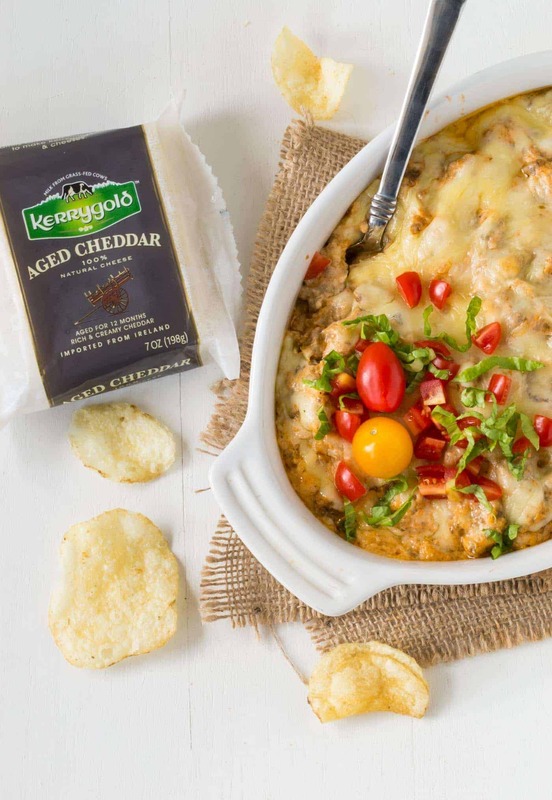 We love this Cheeseburger Dip because it has all the fixings of our favorite burger topped with the robust flavor of Kerrygold Aged Cheddar Cheese. Plus this dip is flexible, too. Love mushrooms on your burger? Saute a few ‘shrooms and stir them into the dip. Craving more meat? Add some crumbled, cooked bacon. However you customize your dip, make sure to set out a big bowl of your favorite potato chips. They make the perfect dipper for this gooey dip. Tip: Missing the bun? You can also serve this Cheeseburger Dip with warm, toasted baguette slices. Another reason this Cheeseburger Dip scores big? You can make it ahead of time. Prep the dip the night before, pop it in the fridge and then bake through right before kickoff. Hosting duties – and game day apps – don’t get much easier than that! Brown ground beef in a skillet over medium heat, adding onion and garlic about halfway through browning. Drain excess fat. Season to taste with salt and pepper. Stir together cream cheese, mayonnaise, ketchup, sour cream and 5 ounces of shredded cheese. Stir in beef mixture until well combined. Pour into a greased 1-½ quart baking dish. Top with remaining 2 ounces of shredded cheese. Bake for 25 minutes or until bubbly. Garnish with chopped lettuce and tomato, if desired. Serve warm with potato chips. This dip can be prepared through step 3, covered and refrigerated for up to 24 hours. Continue with step 4 when ready to serve allowing a few extra minutes of baking time if dip is cold.